Curated by musician, composer, and educator Christopher Auerbach-Brown, Sound and Vision displays a variety of instruments built or owned by local, regional, and national instrument builders and tinkerers. 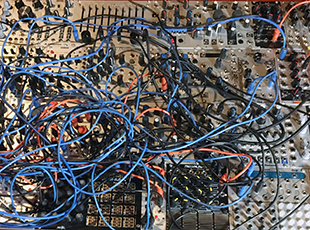 Ranging from a hand-painted cello to hand built modular synthesizers and unusual items such as the Marxolin Aqua Lin, the instruments on display in Sound and Vision challenge the notion of what musical instruments are in the first place. Exhibition contributors include musicians Brad Bolton, Bbob Drake, Mike Hovancsek, Walt Mahovlich, David Russell Stempowski, Karl Vorndran, instrument maker Anne Cole, and illustrator Suzie McGinness. “For hundreds of years, musical instruments have been designed to please both the eye and the ear,” notes Auerbach-Brown. “Instruments such as violins and celli, woodwind and brass instruments, and keyboard instruments like the piano and pipe organ, have been created for both immaculate sound production and overall visual appeal. The achievements of famous instrument builders like Stradivarius and Amati come to mind, and in more recent times Leo Fender, Robert Moog and Don Buchla can be considered pioneers in this field. The community is invited to join us for an opening reception on Friday, September 1, 6-9 p.m.